The issues facing today s grant makers are significant. Although foundations provide only part of the support for nonprofit organizations, obtaining foundation support is often thought to help in raising other forms of support from individuals, corporations, and government. Today, grant makers are questioning how they select grant recipients, how they assess success in their grants, and how they measure their own management. The answers to these and more questions are still being formed. The goal of this issue is to share the questions and invite others to join in suggesting solutions to improve and strengthen grant–making organizations. The chapters in this issue can be read as loosely interconnected and building on one another. 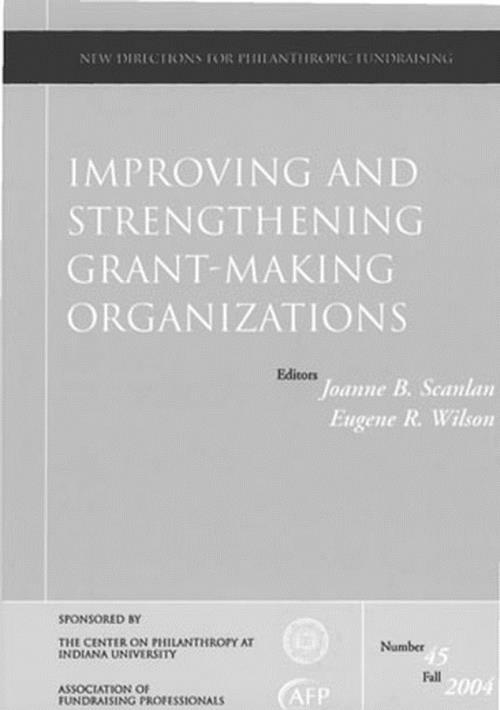 They include an historic overview of grant–making and grant–seeking; views of governance and how mission can be attained through talented grantsmanship; an examination of the principles and practices for effective grantmaking from the Council on Foundations membership in the council; and the benefits of self–evaluation as it has been applied at the David and Lucile Packard Foundation as a way to increase transparency, accessibility, and accountability. Other chapters look at the process from knowledge management to knowledge builing; development of a common language and performance standards for private foundations; foundation ethics, the growth of the online sector of philanthropy, and philanthropic choice and donor intent. This is the 45th issue of the quarterly series New Directions for Philanthropic Fundraising. Editors Notes (Eugene R. Wilson, Joanne B. Scanlan). A full century of philanthropic experience provides a clear perspective on forces that shape the future of foundations. Periodic self–evaluation can renew the vitality of any foundation. Foundations and grantees are reexamining their traditional relationships and forming new types of partnerships. Foundations are becoming more knowledgeable about their programs in the service of genuine social change. Foundations can equip grantees and policymakers with actionable information that enables them to be more effective. A common language and performance standards for private foundations would improve transparency and accountability. A code of ethics has become a necessary tool for managing philanthropy s toughest choices. The electronic marketplace challenges the dominance and operating styles of organized philanthropy. Ensuring adherence to donor intention requires thought, planning, and donor effort, as well as fidelity of the trustees.